hypothesize about the effects of impervious surfaces on daily life. 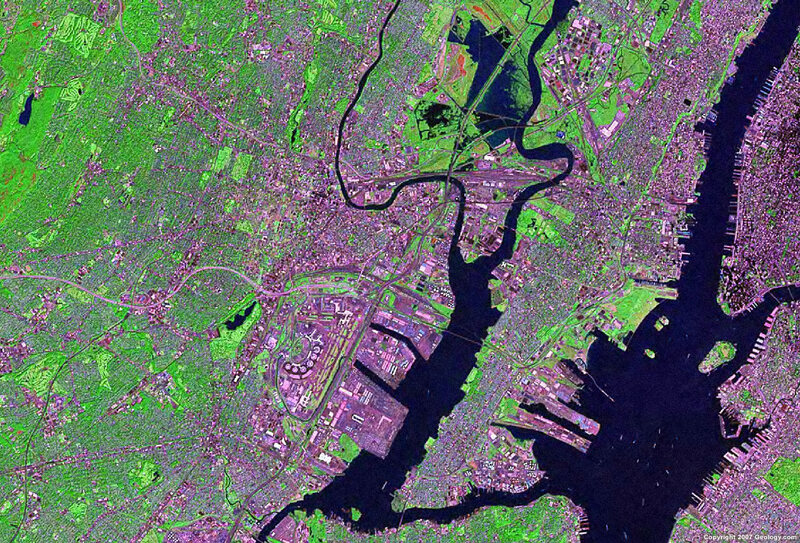 describe and interpret images, data, and maps of New Jersey. analyze the relationship between land development and the environment. go on a walking field trip around the school neighborhood. observe the behavior of water on different surfaces. report to the class information gathered in an article about human-environment interaction. identify the role that rights and responsibilities (and civic virtue) play in sustaining and improving life for the common good. Optional: Pictures of the city or school or neighborhoods where learners live. One copy of Handout One: Earth Bio Poem Template for each learner. One copy each of a variety of articles about land use, impervious surfaces, and human-environment interaction. See the Impervious Surface Resources in the Bibliographical References and search Star-Ledger for relevant articles. Make sure every group of two or three students has a different article to read. Solecki, William, et al. Department of Geography, Hunter College. "Mitigation of the Heat Island Effect in New Jersey." Abstract. (Set up the following demonstration. Line a large strainer with a coffee filter. Add a 1/2 inch layer of sand and an inch of top soil. Put the strainer over a clear jar. Tell the students that this demonstration represents storm water flowing over a natural area with healthy drainage.) In front of the students pour some dirty water through the permeable ground. Ask the students to observe the water in the bottom of the container and the condition of the sand and soil. Review the water cycle and ask the students what part of the water cycle this represents (groundwater). Ask the students what would happen if the storm water met ground that (because of urban development) was not permeable. Discuss the issue of stormwater runoff and the resulting flooding, pollution, effects on the water cycle, and degradation of natural wildlife habitats. Ask students to report their observations over the past 24 hours of the amount of pavement around their neighborhoods. Ask them why they think northeast NJ has so much pavement and so little green space. (They may cite proximity to NYC, population density, land development, insufficient city planning, and transportation needs). Encourage them to share their reflections about the amount of pavement and impervious surfaces they see around their community and homes. Ask the learners to make estimates about the percentage of their community and surrounding area that is covered by development rather than green space. Write their estimates on the board. They may list the types of surfaces (buildings, roads, roofs, parking lots, railroads, etc.) that replace green space. Tell them that even hard-packed dirt can be impervious. Ask students to hypothesize about what a large percentage of impervious surfaces means for the beauty of the area, the environment, and/or their health and wellbeing. Share the following facts with the students: Impervious surfaces do not allow water to seep naturally into the groundwater. Impervious surfaces (such as in an urban area) affect the water cycle, contribute to water and soil degradation, reduce species diversity, and increase the urban heat index. The diverted water picks up pollution and moves over land into lakes and streams, promoting flooding and increasing pollution. This in turn increases health problems. Urban planners are aware of the issues, and there are laws in place to limit the amount of impervious surface area. Remind the students of their pledge (mission statement) to be environmental stewards. Tell the students that they may be able to help raise awareness about the issue of impervious surfaces and act as advocates (and stewards of the environment) to decrease the amount of impervious surfaces in their communities. In this lesson, they will gather facts and learn about the science of the issue so they can be better advocates. Have each group examine aerial and other available pictures of the community. They should discuss and describe the percentage of the community that is in a natural state (parks, rivers, trees, lawns, etc.) and the percentage that is developed. Ask them to come to consensus and write their estimated percentages. Then have each group analyze and describe the surface temperatures and write a hypothesis about what creates the higher numbers in identified areas. Finally, have each group examine a population density map and speculate on the human-environment interaction. Bring the whole class together, and have each group report their conclusions.Discuss their findings and discuss whether the evidence shows a higher or lower percentage of impervious surfaces than they predicted at the beginning of the lesson. Discuss the relationship between population density, land development, and environmental degradation. Take an informal field trip around the school neighborhood. Have the students bring refilled water bottles along. Bring along a stop watch or watch with a second hand and student notebooks. As a group, walk around the surrounding neighborhood to look at the amount of green space vs. developed space. Challenge the students to look for natural areas that need improvement or developed areas that might be converted back to green space with some help from the community. Challenge them to identify and distinguish between naturally occurring processes and human intervention. On the walk, make scientific observations about permeable ground surfaces. Find a variety of surfaces around the neighborhood on which to pour a bottle of water. Time how long it takes the water to seep into the ground on different surfaces. Have students record the trials in their notebooks and describe the ground cover. If the water runs off rather than seeping in, they should describe that (how fast and where it moves). Upon returning to the classroom, list descriptions of the different ground covers and discuss the impervious or pervious nature of each. Discuss the following question: "What impact do human activities have on the cycling of water and other matter?" Ask the students to compare and contrast the responsibilities of the US government, the state government, business, and individualsfor limiting and improving the human impact on the environment. Before class, copy a variety of articles about land use, impervious surfaces, and human-environment interaction. See the Impervious Surface Resources in the Bibliographical References and search Star-Ledger for relevant articles. Copy enough articles so every group of two or three students has a different article to read. Give the student groups ten minutes to read their article and make a bulleted list of facts and information to share with the class. Their goal is to find and report information that will help the class understand the effects of impervious surfaces and propose solutions. After ten minutes, give each group 3-5 minutes to report their findings. The other students should take notes. Discuss the environmental risks and benefits associated with societal activity. After all groups present, discuss the findings and generate enthusiasm for making a difference for New Jersey. Discuss the community's rights and responsibilities related to the article issues. Discuss their right to have a healthy environment and personal responsibilities toward working to improve the environment for the individual and common good. Define civic virtue as the habits of personal choice that benefit the common good and are important for the success of the community. Have each learner write an individual Earth Bio-Poem (Handout One) that reflects on the discussions about taking care of the earth/environment. Emphasize the use of proper spelling and neatness. Teacher Note: Typically bio-poems are written with a person or animal as the subject, however for this bio-poem, use the earth as the subject. Conclude this lesson by having the learners share their poems in small groups. Display these poems in a designated display area or publish in a school newspaper. Observe group participation and individual contributions in discussions. Also, assess whether students completed the bio-poems, using appropriate spelling, grammar, and neatness. Benchmark HS.1 Define and give an example why conflict may exist between individual freedom and the community. Benchmark HS.3 Identify the relationship between individual rights and community responsibilities.